The story of the country-western singer Hank Williams, who in his brief life created one of the greatest bodies of work in American music. Best known as “Loki” in the Thor and Avengers movies, Tom Hiddleston takes the lead for 2016’s I Saw the Light. 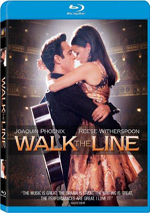 The film offers a biopic that looks at the life of country legend Hank Williams. 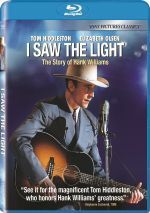 Light opens in December 1944, where we meet Williams (Hiddleston) as he marries Audrey Mae -Sheppard (Elizabeth Olsen). Though he’d been canned from a previous radio show due to his trouble with alcohol, Williams gets another shot and enjoys a slow rise to prominence that leads him to a major label record contract in 1947. All the while, though, Williams continues to battle with the bottle. This impacts his career and relationships, as his tale builds toward his death in early 1953 at the age of 29. Spoiler alert? Maybe, but I suspect anyone who watches a movie about Hank Williams – much less reads a review of one - already knows of his untimely demise. Like Buddy Holly, Williams’ youthful passing acts as part of his legend. Despite Williams’ age at the time of death, he packed a lot of drama into his short existence – more than enough to sustain a two-hour feature, one would assume. And perhaps one would assume correctly in the hands of another filmmaker, but as executed by writer/director Marc Abraham, Williams’ life doesn’t give us a particularly interesting tale. Though he boasts a long career in Hollywood, almost all of Abraham’s prior work came as a producer. Light presents his second cinematic directorial effort – after 2008’s forgotten Flash of Genius - and his initial screenplay. Perhaps if Abraham had written/directed a Williams biopic at a younger age, he might’ve brought something fresh to the table. After decades in movies, though, I get the feeling Abraham suffered from exposure to too many clichés, as a strong “been there, done that” vibe permeates Light. Granted, it’s tough for biopics to separate themselves from the pack, as there are only so many logical ways to tell a person’s life story. Still, I’d have liked to see a little more spark from Light, as it simply follows a tired, uninspired path. Perhaps I wouldn’t mind the banal nature of the plot if the film gave us more introspection and depth. Unfortunately, we never get a good feel for Williams or the other characters. He comes portrayed as a man surrounded by pushy women who finds it tough to say “no” and loses himself in booze – that’s about it. Any attempts at greater psychological involvement fail to occur. That said, Hiddleston does his best to bring life to Williams. He pulls off a credible Southern accent and adds a little charge beneath Williams’ usual amiable “go along to get along” attitude. Most of the movie’s strong points relate to Hiddleston and his fellow actors. Unfortunately, Hiddleston can’t redeem the project’s failings. I Saw the Light never turns into a genuinely bad biopic, but it winds up as a dull one. Despite a smattering of interesting moments, this seems like an uninspired look at a legend. I Saw the Light appears in an aspect ratio of approximately 2.40:1 on this Blu-Ray Disc. The movie came with excellent visuals. Sharpness maintained a high caliber of clarity. Virtually no softness marred the presentation, as it remained tight and well-defined. I saw no shimmering or jaggies, and both edge haloes and print flaws also failed to appear. Can’t Hollywood at least avoid teal and orange for period biopics? Apparently not, as those tones dominated the film’s palette. Despite the tedious nature of those choices, the colors looked well-represented for what they were. Blacks seemed dark and deep, while low-light shots offered solid delineation. Everything about the transfer satisfied. Though not as memorable, the film’s DTS-HD MA 5.1 soundtrack worked fine for the material at hand. Music dominated and used the various speakers well. Effects got less to do and usually offered general ambience. That left us without much in terms of auditory fireworks, but given the story’s character focus, this made sense. Overall audio quality seemed good. Speech was natural and concise. Some singing appeared a little edgy, but that felt like a conscious choice to echo the original recordings. Music sounded peppy and full, while effects seemed acceptable. As mentioned earlier, these elements lacked much to stand out from the crowd, but they appeared accurate enough. This all added up to a “B-“ soundtrack. The disc’s extras launch with an audio commentary from writer/director Marc Abraham. He offers a running, screen-specific look at story/characters and historical elements, cast and performances, costumes, props and period details, music, camerawork and editing, sets and locations, and various effects. Overall, Abraham creates a good commentary. He keeps happy talk to a reasonable level - he praises the participants but he doesn't gush and he sticks with relevant topics the majority of the time. Abraham turns in a chatty, informative piece. 10 Deleted Scenes appear. Including optional introductions from Abraham, these fill a total of 22 minutes, seven seconds. (Without the intros, the segments take up 13:51.) Mostly brief, the most intriguing scenes feature Hank’s father; absent from the final cut, he doesn’t get a lot to do here, but those sequences still add a little. Otherwise the cut snippets tend to be minor and forgettable. We get a little more detail for a few supporting characters but nothing that stands out as especially useful. Three featurettes follow. Talking Hank goes for 21 minutes, 39 seconds and offers a chat with actor Tom Hiddleston and executive music producer Rodney Crowell. They discuss Hiddleston’s casting and approach to the role, music and Hiddleston’s training, and reflections on Hank Williams. Hiddleston dominates the chat and provides good insights about the subject matter. Illuminating a Legend lasts 13 minutes, six seconds and includes notes from Hiddleston, Abraham, Crowell, producers G. Marq Roswell, Aaron L. Gilbert and Brett Ratner, and actors Elizabeth Olsen, Cherry Jones, and Bradley Whitford. “Legend” looks at the project’s development, cast and performances, characters and story, music, and thoughts about Hank Williams. “Legend” provides a decent overview, though we already most of the relevant thoughts elsewhere. Finally, A Night in Nashville takes up 10 minutes, 52 seconds. It takes us to the movie’s Nashville premiere and also includes some musical performances from Hiddleston. Unless you really want to hear more of Hiddleston’s singing, you can safely skip this piece. The disc opens with ads for The Lady in the Van, Son of Saul, Dark Horse, The Meddler and Maggie’s Plan. We also find the trailer for Light. Outside of some good acting, I Saw the Light fails to make much of an impression. It creates a somewhat dull biopic that doesn’t bring its subject to life. The Blu-ray offers excellent visuals as well as acceptable audio and a pretty good collection of bonus materials. Light lacks much to make it an involving drama.